I'll get a close up of one of these 100THs soon! Wild looking tube and interesting looking project you've got there Paul. Is that a Fisher 400 I spy serving shop duty for tunes? It's a Fisher 500. I have a pair to rebuild, but I've been collecting parts very slowly. Good things sometimes start on plywood. The 100TH amp reverted to an 810, and they are all finished. Nice looking amp. Can you share a schematic or describe its circuit in little more details? Thanks. The 810 is run at about 650V and 180mA. 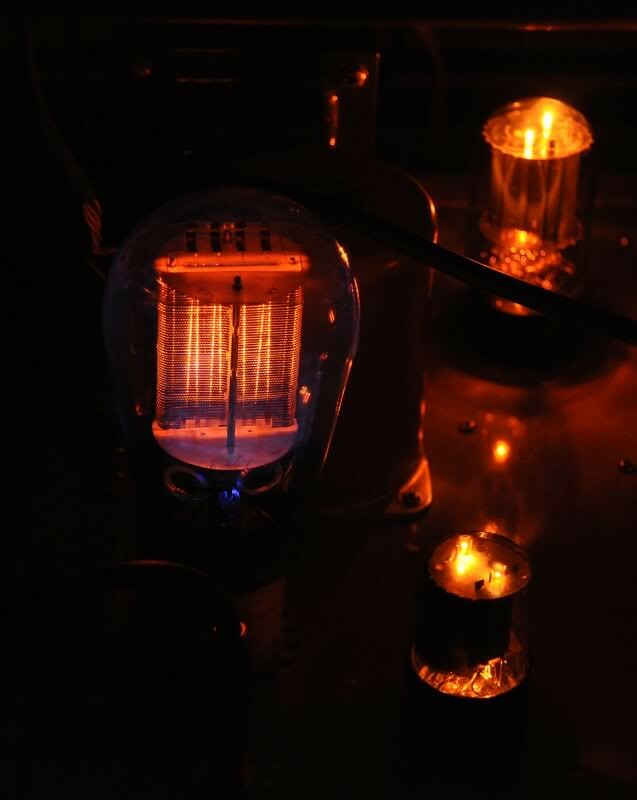 The driver is an EF86 run as a pentode feeding a pair of 12GN7 triode wired pentodes acting as cathode followers, and they are directly coupled to the 810's grid. There is a -100V rail and a solid state constant current source under the cathodes of the 12GN7 tubes to provide them adequate operating current when the 810 grid isn't. I added a couple of VR-105 voltage regulator tubes between B+ and the driver supply to knock the 650V down to more reasonable levels. The 810 tube is DC heated with a choke input filter fed by a bridge of very beefy Schottky diodes tabbed down to the chassis. I managed to get 50WPC @ 10% THD and a damping factor of 5 with only local feedback, though I have enough gain leftover that I could switch in 6dB of feedback around the OT to get more damping if required. Each amp weighs 64 lbs, and the customer is now finally convinced that a stereo amp wasn't the right choice! I'm not planning to post a schematic, but work on this project has lead me to consider doing a lighter 30W design that will work with tubes like the 805, 838, 203A, etc. that would be a far more reasonable DIY project to publish. Here’s one I took over the weekend. No, it’s one of those newer mesh plate 2A3 tubes... Sophia, I think? I would say so called meshplate -- more like perforated plate. Kinda garish lookin' tubes, but pretty in the dark* and pretty good sounding, too. EDIT: oh, that's a very nice photo of one that you posted earlier, @Redboy! Here’s another, of a different sort of tube.